First things first though, the app is enabled by our open API, and built in partnership with Techlightenment and Facebook. We turned it around very rapidly, in fact my first sketches and early wireframes were only done a couple of months ago, although some of the ideas about how you might try an experiment with “social news” have been kicking around GNM for a good while longer. One of the challenges has been to convey that the app is not a website. In my original plans and sketches there was no app homepage, and the Guardian’s existing main Facebook page would have been where you were sent if you tried to access the root URL. However, Facebook Canvas apps require you to have a “homepage”, but I think this was a bit unhelpful for us at launch. I’ve never really envisioned the app as a destination in itself, or as something people will bookmark. The idea is that as people come across Guardian content in the course of their regular activity on Facebook, they will dip in and out of the app, making the Guardian presence within Facebook more seamless. We know that the vast majority of referrals to the Guardian website from Facebook come in at the article level, and so the app is optimised around that experience. On launch day, though, of course you promote the app with the URL of the homepage, which non-plussed quite a few people, particularly in the media circles I hang around in. “But how do I get to the rest of the content?” was a repeated refrain. Obviously we’ll learn more as more people join and start to use it - but I think starting your journey at apps.facebook.com/theguardian misses the point of serendipitous article-to-article discovery. How do articles get into the app? Karen Loasby did some lo-fi testing of the app prior to launch, and we discovered what we suspected, that this was going to be a “Love it” / “Hate it” proposition. Some users recoiled in horror at the very idea, others clicked through quite happily. 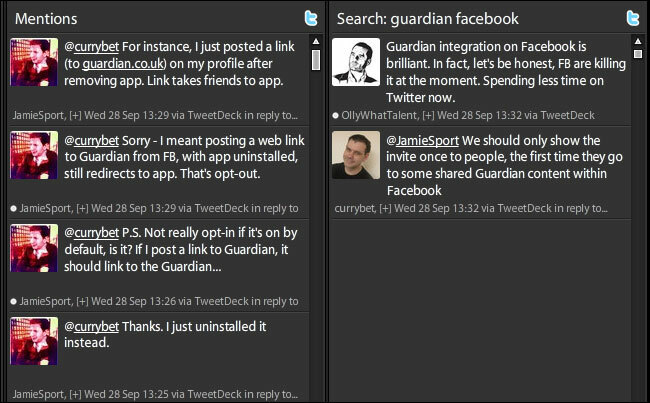 Post-launch this was exemplified time and time again when I looked at the Tweetdeck columns. I was personally replying to people with misgivings, whilst seeing another column with specific praise for the approach we’ve taken. I look at that audience of 750m+ and think there is a sliding scale, from people who use Facebook heavily, but never or hardly ever consume Guardian content, and at the other end there are loyal Guardian users who rarely or reluctantly use Facebook, or who don’t use Facebook at all. The app was always likely to be more disruptive for people the closer they are to using the regular Guardian site or our apps. The frictionless sharing, however, puts our content into the news tickers of millions and millions of users who might never otherwise come across Guardian content. And in our Windows and Android and Kindle and iPhone apps. And in the new iPad edition. All those other URLs (even the ones you can’t see in the apps) ultimately map to that. We’ve tried to make it easy to opt-out of the app. We are only presenting it to you if you were already using Facebook, so nobody outside of the Facebook environment need ever come across it. If you click ‘cancel’ when asked to join, we direct you straight through to the story you wanted on the Guardian site, and set a cookie so as to try and avoid asking you again. How widely your reading activity is shared throughout Facebook is controlled by the existing default you have on your Facebook account for sharing - but you can customise it specifically for the Guardian app, including only sharing your reads with yourself. You can remove the application by visiting the app homepage, from the apps settings menu on your Facebook account, and on every page by clicking “Why am I seeing this version of the page?” to reveal the drop-down privacy instructions. 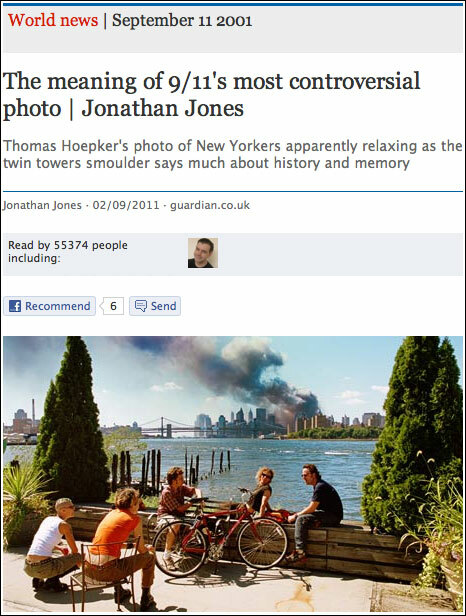 Take this piece by Jonathan Jones - “The meaning of 9/11’s most controversial photo”. It was published on September 2nd. Since the Facebook app launched on September 22nd, it has been viewed within the app over 55,000 times. Nothing is allowed algorithmically to be in the “popular right now” section that is older than 24 hours, and so all of that traffic has been driven by frictionless sharing, and the headline appearing in news tickers and feeds around Facebook. That is an amazing amount of long-tail traffic for an article. And we’ve also seen the demographics using the app shift consistently downwards from the thirtysomething media commentators who were taking a peek on day one, to reaching a much younger audience. This has genuinely been one of the most fascinating projects of my career. From working with colleagues like Meg Pickard and Dan Catt on ideas of how “social news discovery” might work, to working with Facebook themselves, who definitely live the values of “done is better than perfect” and “move fast and break things”. I’ve enjoyed a lot of the debate on Twitter and blogs about whether it has been the right thing for the Guardian to do - today notably I realised it has annoyed both James Cridland and John Handelaar, two people whose digital opinions I value highly. I also found myself at one point just fixated on hitting the refresh button in the browser watching the numbers tick up and up and up and up on the metrics of how many people were viewing and sharing Guardian and Observer stories in Facebook, and very probably discovering our content for the first time. Next? Well, we’ve already released v1.1, and we’ve got some new additions to the app to come. Will that make the app “finished”? I don’t think anything like this will ever be finished. I’ve got a UX snagging list, and the project team have got a bunch of ideas of where else the app could be developed, and presumably, Facebook will keep on developing their timeline and news ticker, and we’ll need to be thinking about how we grow an audience for Guardian content within Facebook’s space for some time to come. As ever, apps like this don’t arrive without there being a great team working behind them, and I’d like to thank: Matt Andrews, Gideon Goldberg, Stephen Wells, Sheena Luu, Lynsey Smyth, Karen Loasby, Lisa Villani, Piers Jones, Joanne Ellis, Meg Pickard, Dan Catt, Hayley Dunlop, Andrew Lepki, Hannah Freeman, Charlene Prempeh and Nina Lovelace. I’m UX & IA Lead at the Guardian. This is my personal blog. The views expressed on currybetdotnet are my own, and do not reflect the views of Guardian News and Media Limited, or any current or former employers or clients. Read my blogging principles. By Martin Belam on 12 October 2011. Your post prompted me to go back to the Guardian Facebook app and simply figure out how to stop people seeing what I've read. I don't mind the idea of reading articles (and commenting) within Facebook - it's the frictionless sharing which feels awkward. The web has given us this mental model that you can follow and click links with abandon as there are no consequences - and that in order to Do Something you have to click a button. One thing to note there Frankie is that we just push the "read" into the OpenGraph. I think you'll see that Facebook are working on the algorithms to make that display less noisy - I already see that my sessions of "reading" in the app are sometimes bundled together, with the most read/popular articles given priority in the presentation. With the Guardian is there a way to stop the auto broadcast or possibly have it post only the ones you... say thumbs up to kinda like stumbling? Very good post Martin, and i love the app. To support your argument, i read most articles in the Guardian daily, either on the Iphone App or online. However i was told about the Facebook App by someone who rarely reads the Guardian (and is in the younger demographic). He says "All my mates love it. It's the best thing on Facebook". That group are definitely your target. I think you have done the right thing by having an easy push on this. However, i am surprised i didn't even know about it. I have to be honest here, I like the App and use it alot. I've talked to a few people and its getting mixed reviews. So nobody outside of the Facebook environment need ever come across it. I think the problem arises (and maybe the "breaking the open web" part comes into it here as well) when someone shares an app.facebook link outside Facebook. Then, when readers who aren't on Facebook (or are signed out) try to follow the link, they just get a generic Facebook login screen -- with no way to get to the Guardian story. For example, the link in your earlier tweet is only followable by Facebook users, despite essentially being a Guardian story.